Heat the remaining olive oil in a sauté pan and brown the bread on both sides. Drain the slices on paper towels, then place a slice in each of 4 individual soup bowls. Pour the soup over the bread and divide and sprinkle the cheese over the top. Broil the soup until the cheese melts. Serve immediately. 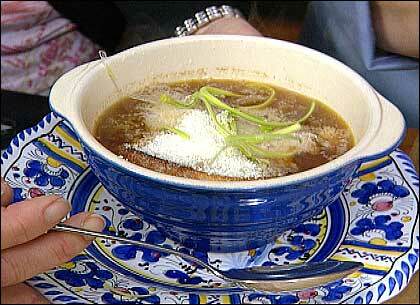 Chef Maryann Esposito notes: Tuscan cooks are partial to making soups, often favoring them over pasta. And like pasta, they are a first course or depending on the number of ingredients that go into them, they can serve as a main course. Bread is often a component in Tuscan soup, either as a thickener or placed in the base of a soup bowl. In the summer I like to make soups on the lighter side, favoring a light tomato soup, but when crisp weather arrives, give me something hearty like this onion soup. I make it using a variety of onions from my garden but common yellow onions yield a very nice flavor. This segment appears in show #3007.